The Boston-based group Mile Twelve continues to march forward. The winners of IBMA’s 2017 Momentum award have been nominated for 2018 Emerging Artist of the year, and they show no signs of slowing. Their debut full-length album Onwards was met with critical acclaim and earned the band time at the top of the bluegrass charts as well as an IBMA nomination for 2018 Instrumental Recorded Performance of the Year. They have been making noise in bluegrass with their virtuosic approach to the music, clever song-writing and arrangements and a youthful energy that appeals to all age groups. At the end of 2018, they returned to the studio to record their sophomore project. Paul Schminger, President for the IBMA says, ‘What I and so many others love about Mile Twelve is their musicianship, material and energy. Their sound is fresh and innovative, yet rooted in a solid foundation of bluegrass. 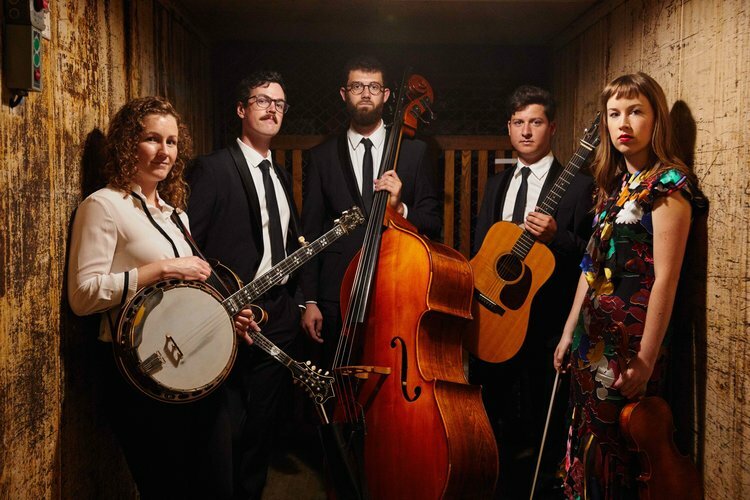 They move easily among traditional bluegrass classics, terrific original material and interpretations of pop music classics, while knocking you over their strong instrumentals and harmonies.’ It’s a group to watch in the coming decade. With members band in Boston and Nashville, the lineup includes David Benedict (mandolin), Catherine ‘BB’ Bowness (banjo), Bronwyn Keith-Hynes (fiddle), Evan Murphy Acoustic guitar, vocals), and Nate Sabbat (bass, vocals). Ray Legere is a world-reknowned fiddle and mandolin player who has been making his home in Sackville (NB) for the past 35 years. He learned the mandolin at 10 years old. As Canada’s top fiddle and mandolin artist, he has teamed up with Gaspe native Frank Doody & the Acoustic Horizon. Ray Legere has seven CD’s to his credit, some featuring his own compositions. Because of his musical versatility and Acadian background, he is regularly being invited to perform with both anglophone and francophone artists in the Maritimes, and is a regular member of the band of the Quebec hit television show Pour l’Amour du Country. His astonishing technique and boundless musical energy enthrall and excite musicians and audiences alike. Ray is a multiple ECMA award winner, has won numerous awards for his fiddling and mandolin playing, and was recently inducted into the New Brunswick Country Music Hall of fame. He is a five-time winner of the ECBMA in the categories of Mandolin and Fiddle Player of the Year, distinguishing him with a Masters Award for each. At the age of 16, Ray filled in for Bill Monroe, the Father of Bluegrass, when Monroe took ill before a concert. At age 21, the young Ray was visiting a friend in Nashville when Rhonda Vincent asked him on the spot to step in and perform with her on the stage at the Grand Ole Opry. He didn’t have a fiddle with him, so he borrowed one from her. Accompanying Legere is the talented group of Acoustic Horizon, which is comprised of Frank Doody, performing on banjo, dobro, guitar and vocals; Marcel Duplessis on bass and Emile Robichaud, guitar and vocals. Simply Blue is no stranger to bluegrass music. The band features Jamie Melanson (lead singer/guitar), Guy Godin (vocalist/mandolin), Jesse Hebert (lead singer/bass), Alexandre Landry (vocalist/fiddle) and Reno Richard (banjo). One year after their first appearance on a bluegrass stage, Simply Blue won the Rollo Bay Bluegrass Festival’s Showcase and, ever since then, continued sharing their passion for bluegrass music all around the Maritimes, becoming one of the fans’ favorite. In 2014, those accomplished musicians won the Most Promising Band of the Year award at the Eastern Canada Bluegrasss Music Awards (ECBMA). Recently, Simply Blue was nominated for Band of the Year at the ECBMA. They released their first album in 2014, entitled ‘Tears and Broken Hearts’’, featuring the internationally renowned and remarkable bluegrass singer Rhonda Vincent. With the success of their first album and the urge of producing more songs, Simply Blue released a second album entitled ‘Full Speed Ahead’’ in spring of 2016. These albums explore a modern dimension of bluegrass while preserving its traditional roots. "Grassline’’ is a new band with the formation of three generations of the Eddy Poirier Family. Born in Rogersville (NB), Eddy Poirier is a member of the N.B. Country Music Hall of Fame, and was the front man for the legendary band "The Bluegrass Four’’. Eddy plays banjo, fiddle, guitar, mandolin, lead and harmony vocals. He’s a five-time winner of Entertainer and Guitar Player of the Year at the ECBMA’s, making him a master in both. He also has several recordings to his credit. Brian Poirier, Eddie’s grandson from Moncton, plays the mandolin, his favorite instrument, but also plays banjo, fiddle, guitar, dobro, bass, autoharp, and does vocals. Laurie Chavarie, a cousin of the family, was born in Acadieville (NB). He plays guitar, mandolin and does vocals. Playing in several bands since his teen years, he just recently ended a 20-year stint fronting "Timberland Express’’. Joel Chavarie, Laurie’s son from Moncton, is a newcomer to the Bluegrass circuit. He’s in his second year playing the upright bass with Grassline. Jim Collette, from Moncton, formed his first bluegrass band, Misty Mountain, by the age of 15. He moved to Ontario in 1985 where he co-founded the Canadian Bluegrass award-winning group Blueridge. He performed several years on the Canadian bluegrass circuit, as well as several showcase performances in Nashville at the SPGMA Bluegrass Awards and at the iconic Station Inn. After a long stay in Ontario and Montreal, Jim returned to the Maritimes and joined Eddy Poirier & Grassline Bluegrass Band. The Oxbow Mountain Boys specialize in Traditional Bluegrass & Old Time Country Music with a bit of flair and humor. They are all seasoned musicians in their 3rd year together as a group. They really enjoy the camaraderie of performing together as well as interacting with the audience in a light-hearted way. The group was a big winner at the 2018 Eastern Canada Bluegrass Music Awards (ECBMA), winning six awards, including 2018 Band of the Year. Members of the Oxbow Mountain Boys : Greg Hamilton, from Harbourville (NS) – plays the banjo, lead and harmony vocals and delights audiences with his high lonesome sound. Winner of the 2018 ECBMA Banjo Player of the Year. Al Ryan, from Sackville (NS). Along with his lead and harmony skills, he brings a solid mandolin performance as in the old time traditional sound. Winner of the 2018 ECBMA Mandolin Player of the Year. Charlie Bourque, from Prospect Bay (NS), plays the guitar, does lead and harmony vocals. He is an accomplished multi-instrumentalist playing banjo and mandolin as well. Winner of the 2018 ECBMA Guitar Player of the Year. Rod Blair, from Spa Springs (NS), brings a great fiddle to the band sound. He is the winner of the 2018 EBCMA Fiddle Player of the Year. Brian A. Hazlett, lives in Hantsport (NS). He has been playing music his entire adult life and loves his upright double base. Winner of the 2018 EBCMA Individual Entertainer of the Year and was awarded EBCMA Master Bass Player in 2017. The Oxbow Mountain Boys have been entertaining audiences all throughout Atlantic Canada and have performed at many festivals, concerts and other venues. Kids in Bluegrass Club is an Eastern Canadian registered non-profit organization that works with young musicians, offering guidance, and instruction on many aspects of learning and performing Bluegrass and Oldtime music. They learn to work together including to produce, perform and emcee a fun-filled, professional stage show worthy of any festival, thereby educating the next generation about culture and heritage. Chantal O’Neil is the President and founder of ‘Kids in Bluegrass Club’’. ‘Kids in Bluegrass Club’’ has organized a youth concert for the Annual Nova Scotia Bluegrass & Oldtime Music Festival for the past 6 years and has proven to be very successful, entertaining and increasingly popular show. They organize youth concerts for festivals where they spotlight and provide a maximum of 10 youth musicians and singers under the age of 19 from each of the Maritime provinces. Husband and wife duo, Janet McGarry and Serge Bernard, have performed for many years at bluegrass festivals and many other events throughout Eastern Canada and beyond. Their unique vocals make them crowd favorites wherever they appear. Janet is a 5 time Award winner of the “Female Vocalist of the Year”, earning her a “Masters” at the Eastern Canadian Bluegrass Music Awards, and she is also a proud “Daughter of Bluegrass”, a group of International leading women in Bluegrass. Janet’s most recent CD is titled “Forever is the Love”, released in July of 2017. Serge is a talented multi-instrumentalist playing guitar, banjo, mandolin and bass with ease, as well as being a powerful harmony singer. He is also well known as the host of the popular radio program Bluegrass Island which airs weekly on CFCY. Copyright © 2019 Evangeline Bluegrass Festival. All rights reserved.